It’s a truth so many of us keep in the dark corners of our lives as instruction librarians: we were never taught to teach. We’re not unusual, really, and the same is true of many of our higher education colleagues. We study a field, we gain some expertise in that field, and then – bam! – we’re thrown into the classroom without even a short lesson on instructional pedagogy. Of course, most instruction librarians adapt admirably to this circumstance by doing some research, talking to more experienced colleagues, and gathering ideas from conferences. We get up to speed as quickly as possible by drawing on the knowledge around us. In this way, we improvise and improve our teaching to a level that is, in most cases, sufficient. When we try to adapt our instructional strategies to a new medium, however, the challenge begins anew. Teaching in the classroom is not the same as teaching through a course management system (such as Blackboard), and teaching on Blackboard is different than teaching through video. All of these technologies tax our already minimal knowledge of instructional theory, and the results can turn out to be rather ineffective. I’ll be the first to admit that I have made students watch far too many dull, lengthy screencast videos in the effort to help them learn about research. And I’ve seen many similar videos around on YouTube and on other library websites. Our intentions are always good – to educate, to equip students with research skills – but the tools we produce could be better. Recently my colleagues and I have begun a project to train ourselves in the pedagogy and technology of how to make effective video tutorials. I’d like to share some of what we’ve learned so far. It has all been new to me, and I hope that others may benefit from our efforts. A couple of disclaimers: first, I don’t claim to be an expert in video creation or educational pedagogy. My knowledge is still nascent. Second, I don’t advocate video for video’s sake: be sure a video tutorial is the right medium for your intended goals before jumping into the recording process. When you want to teach a certain skill or idea, start by asking: how can I best get this information across? Sometimes it will be video, but other times a step-by-step text description can be simpler and more effective. Although as librarians we’re always eager to embrace the new technologies, it’s helpful to remember that the “old” technologies have their strengths as well. Tasks that involve basic, step-by-step instructions may be better presented as text on a webpage (or–gasp!–handout) that will be easier for students to follow as they complete the steps in another browser window. On the other hand, those that involve navigation through various, complex online interfaces may need video be clear. Sometimes it’s best to provide information in both formats to provide for different learning styles. Two well-known educational psychologists, Richard E. Mayer and Roxana Moreno, have written extensively on the cognitive implications of multimedia learning. Most notable of their writings for our purposes is a 2003 article in Educational Psychologist entitled, “Nine Ways to Reduce Cognitive Load in Multimedia Learning.” The gist of the article is that the human brain’s ability to process information is divided into two channels, the verbal and the visual. And no matter what our multi-tasking Millennials would have us believe, the brain can process only a limited amount of information from each channel at any given moment. Here’s what the cognitive process looks like according to Mayer and Moreno. Information comes in through those two “channels” of our ears and eyes. From everything we take in through our immediate, sensory memory, we select certain words and pictures that are processed to our working, or short-term, memory. At that point we begin making sense out of those pieces: aligning the images and sounds, organizing them into meaning, and most importantly, connecting the results with our prior knowledge in a way that will be added to our long-term memory. All of these steps are important, but perhaps most critical here is what happens between the sensory memory absorbing information and the working memory organizing it: selection. That’s the point where details will be lost unless we are careful to provide the most essential information as clearly and simply as possible, to ease the selection process along. So our students need to go through several steps to make meaning out of what we teach them: first, by paying attention; second, by making sense out of it; and third, by applying it to what they already know about the topic. As a result, educators using multimedia need to be thoughtful about the amount of information we’re providing through video and audio channels, and the pace at which we’re providing the information, to ensure that we’re giving students enough time to process it in ways that make sense to them. If we provide too much information at once, we cause cognitive overload, at which point our students shut down, lose interest, or otherwise simply stop learning. Split Attention Principle: Students learn better when instruction material does not require them to split their attention between multiple sources of mutually referring information. Modality Principle: Students learn better when the verbal information is presented auditorily as speech rather than visually as on-screen text both for concurrent and sequential presentations. Redundancy Principle: Students learn better from animation and narration than from animation, narration, and text if the visual information is provided simultaneously to the verbal information. Spatial Contiguity Principle: Students learn better when on-screen text and visual materials are physically integrated rather than separated. Temporal Contiguity Principle: Students learn better when verbal and visual materials are temporally synchronized rather than separated in time. Coherence Principle: Students learn better when extraneous material is excluded rather than included in multimedia explanations. when possible, considering the particular audience of a video and matching the presentation style to their learning style(s). For instance, consider videos that include both verbal narration and on-screen text. Providing such duplicative information is likely to bog down a student by requiring them to process the same information twice, using both verbal and visual channels. Meanwhile, if the narration and on-screen text is being shown simultaneously with a screencast or other video element, it is likely that the student will not be able to process this third piece at all. Instead, using verbal narration with a screencast will probably be more effective at keeping the student’s cognitive load manageable. Similarly, when using a screencast of a library homepage, keep in mind that the large number of images and links on an average page can also cause overload. It’s easy to add a large arrow or call-out identifying the particular link you want students to see, and it will significantly reduce the cognitive demands of the shot. Mayer and Moreno’s oeuvre includes much more guidance on these issues, as does a 2006 article by Nadaleen Tempelman-Kluit in College & Research Libraries. With busy lives and jobs, many of us choose to create video tutorials on the fly simply by transferring strategies used at the reference desk or one-shot instruction. Honestly, we do it every day at the desk, right, so how hard can it be to simply record the same information? Well, it is harder than one might think when considering both pedagogical and cognitive implications. It’s important to begin with a plan; a breakdown of exactly what the goal(s) of the video will be, how the goal(s) will be achieved, and what exact steps must be shown in the video without any unnecessary or distracting elements. Storyboarding is perhaps one of the most underestimated but most critical parts of the process of creating an instructional video. This is the same approach used by filmmakers to plan out scenes, props, and actors required in every different part of a movie. Storyboarding does not have to be complicated or high art, it can simply be a listing of what will happen in each scene, in full detail. It requires us to walk through every second of the video in advance to make sure it is doing what we want it do. 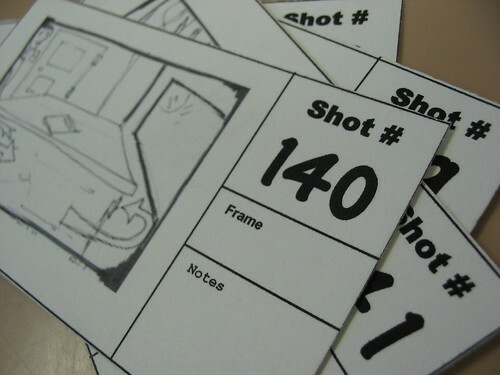 Storyboards can be sketched out on paper or digitally but should incorporate whatever will be taking place on the screen visually, the full script that a narrator will speak, and an indication of any additional sound or graphical elements (such as call-outs) that may be included. I’ve just started using PowerPoint as a storyboarding tool — putting visual elements in the slide section, and audio in the notes — and fellow Leadpiper Derik suggests post-it notes as a quick and easy method. Storyboards help in planning a video so that it can be created in a way that reduces cognitive load for students, while also allowing us to budget our time more efficiently in the creation process. Because each scene needs to be attended to individually, storyboards are useful on another issue in the planning process: reminding us to record video in short, manageable segments. First, this is helpful because it cuts out the precious seconds that tick by when we are transitioning between pages, such as when searching a database and waiting for the results to come up. Second, recording short segments can be wonderful when something in the video needs to be updated later. The web pages and interfaces we rely on for our library catalogs and research databases change frequently, which can create a challenge when trying to maintain video tutorials that include them. When video clips are kept short, it is easy to re-record part of the video that includes the changed visual elements and drop the new clip into the tutorial. Of course, those new clips can only be integrated if our method of organizing video files and completed tutorials is clear. It’s easy to let the long list of video clip, screen shot and screencast files flow into a variety of folders without keeping track of them. However, when those files are carefully tracked and identified (by filename) on the storyboard, and then all of the raw production files archived together for future reference, maintenance and updating suddenly becomes far easier and far less time consuming. Many of the best videos incorporate a mix of screencasting (or screen recording), live video from a camera, and slide clips. In some cases they may also include extra sound effects or supplemental audio tracks. This can get complicated when working with so many different types of files. And, not surprisingly, there is no perfect, easy-to-use software package for video tutorial creation. Camtasia Studio from TechSmith is generally considered to be the standard for true video and audio editing. Camtasia is one of the few programs that accepts a wide variety of audio and video formats, and makes it possible to edit and integrate them in sophisticated ways. On the downside it is expensive and takes time to learn; after using it for over a year I am just starting to feel competent in the software. Camtasia is available for a 30-day trial, and TechSmith provides a number of high-quality (wouldn’t they have to be?) video tutorials on how to use the software. In addition to Camtasia, there are a number of simpler, free programs that make some of the same functions possible. For screencasting only, TechSmith also provides a program called Jing that is far simpler and more user-friendly than Camtasia, so that can be a great place to start for those new to video creation. ScreenToaster is a similar program, but unlike Jing it’s web-based so does not require installation. Unfortunately, neither Jing (free version) nor ScreenToaster offer much in the way of editing options, nor do they provide screencasting files that can be integrated with other video clips. When working just with live video from a webcam or video camera, the simplest editing options are the default PC and Mac programs: Windows Movie Maker and iMovie. Both can be useful and make it easier to get started, but they also have more limited options than Camtasia. For audio editing alone, Audacity is a free program that many use for creating sound clips, sound effects, and podcasts. The settings used during video creation can have a big impact on the quality of the results. For the best quality, experts recommend that the resolution of the video recording should be as close as possible to the final product. For instance, YouTube’s standard video resolution is 640 pixels by 480 pixels, so recording should take place at that image size. We’ve all seen screencast videos that recorded the individual’s entire screen at a resolution such as 1280×720, produced the video at the same size, and then uploaded the video to YouTube, only to see the video size compressed to a degraded and unreadable result. Recording at such a high resolution would, however, be appropriate for YouTube’s High Definition video, which uses 1280×720 as the standard. Recording size can be changed within the video recording software or camera settings, or for screencasting the entire screen resolution can be changed to fit the desired result. It’s important, too, to be consistent in recording size when using video from several sources (screencast, webcam, video camera, etc.). Overall, video should be both recorded and produced at whatever size is needed for the platform where it will be viewed in the end. In general, all of the recommendations from cognitive theory indicate that the simpler the video, the better. The challenge is to balance this simplicity with our other needs: to cover complex material, to cater to various learning styles, to be accessible to hearing impaired students, to work within our often-limited video editing skills, and even to be entertaining. Instruction through multimedia is highly challenging, often frustrating, and extremely time-consuming, but when done well it can have a dramatic impact upon student learning. Common Craft videos are excellent at breaking down an idea or task into its simplest elements and presenting them clearly and concisely without audio or visual distractions. They do all this in mere minutes while maintaining a level of humor and entertainment throughout to keep viewers interested. Notice the simple white background; the creators of this video omitted any distractions or visual elements other than the people on the screen. And it works! Our educational psychologist friends might have recommended against the background music as a non-essential element that adds to viewers’ cognitive load, but otherwise this is a terrific instructional video. Now it’s your turn: What are your favorite examples of high quality instruction videos? What have been your experiences in trying to create videos for teaching? The comments below are open for your thoughts, links, and experiences. Many thanks to Lead Pipers Ellie Collier and Derik Badman, as well as my Boise colleagues Memo Cordova and Ellie Dworak, for providing valuable feedback on an earlier draft of this post. Ganster, L. A., & Walsh, T. R. (2008). Enhancing Library Instruction to Undergraduates: Incorporating Online Tutorials into the Curriculum. College & Undergraduate Libraries, 15(3), 314-333. Oud, J. (2009). Guidelines for effective online instruction using multimedia screencasts. Reference Services Review, 37(2), 164-177. Tempelman-Kluit, N. (2006). Multimedia Learning Theories and Online Instruction. College & Research Libraries, 67(4), 364-9. [RE]Boot Camp: Share Some. Learn More. Teach Better. Very good discussion of tools, methods, and pedagogy. The tools are getting easier to use, and it’s become really easy to slap together a video or screencast without thinking about it, which I have been guilty of doing myself. Captivate and other tools are just like Powerpoint in that they give the user the ability to make really awesome or really terrible presentations. Sometimes you don’t need to use every single feature that the software has, even though it’s tempting to do so. Hopefully your post will keep readers from using text, arrows, fade-ins, and animated gifs all over their videos. While we have Adobe Captivate, I spend most of my time making screencasts and videos with Camstudio (open source), my Flip Mino Camera, and Windows Movie Maker. It’s fairly low tech, but I can usually turn a video around pretty quickly. My storyboard is generally based on the questions I get from students, so I try to make the video for the broadest audience possible. I’m using Blip.Tv to host the videos, and then embedding them on places like this Biz Wiki page. I appreciate the links and further reading you’ve provided, and I’ll definitely be checking those out. Thanks again for a great post. This was extremely useful, thank you so much. Thanks, Kim! This is a wonderful overview of best practices in instructional video creation! It’s perfect content to share with librarians new to video projects as well as a good reminder for those who have been working with video for awhile. I particularly appreciate your great overview of cognitive load theory, which I also view as critical to keep in mind (but you sum it up much better than me). I second your point that video isn’t always the answer. It’s really hot right now and we librarians are all over it, but it can’t always be the right packaging for instructional content. For one thing, a video channels the user’s experience in a linear way when maybe what they really need is to scan text or images for the content that jumps out at them as most helpful. I think video is good for “show and tell” training (i.e. how to use a tool) and, in some cases, to tell a narrative that might be complicated or overwhelming to read. this is cool. but man, creation (meaning “quality” creation) is really time-consuming. shooting a simple video with narration isn’t too hard with some rehearsal, but this professional production stuff is a full-time gig. a couple of years ago, I presented a program for creating flash-based instruction using Powerbullet and Wink (free software) for simple instruction (the files are still accessible here, http://www.pbclibrary.org/SEFLIN/energize.htm), but I haven’t gotten into video editing. before I became a librarian, I thought I would be a media specialist, so I took a few eduction classes, and before that, I thought I could get into TV so I had some production training, so the theory for video production and instruction is still in my brain, somewhere (maybe). and about converting ppt to video (re: “Ron says”), I save the slides as size 14.2 x 10.7 jpgs (matches a 1028 x 764 resolution screen) then use Nero VisionExpress that came with my DVD-burner to make video shows with pretty-good slide transitions. I have one in VCD format that plays on a cheap DVD player and it runs all day on an old TV in the teen area. (sorry, to go on so long..) thanks again. Fantastic article Kim. Thanks for summarizing and sharing. I think more of us could also be using what’s already out there and good as opposed to creating new mediocre. Going on some of the collaboration ideas from Jean’s post, I’d love to see a curated repository of exemplary instruction videos that would could direct students to. I know there are a number of places collecting instruction videos, and even specifically library instruction, but I haven’t seen one with a quality control mechanism or with explicit please copy this licensing. Even better, a repository of the videos as raw material (video clips, audio clips), so that different libraries could remix their own version (with their own specific logos/peculiarities… kind of like NIN releasing songs for fans to remix in Garageband. This is a great summary, thanks! Also, thanks for the shoutout-I’m Nadaleen, author of: Tempelman-Kluit, N. (2006). Mul­ti­me­dia Learn­ing The­o­ries and Online Instruc­tion. Col­lege & Research Libraries, 67(4), 364 – 9. I love the Common Craft video examples as a good example of less is more. I actually tried a few of these type of videos for the library, and the process highlighted just how hard they are to make, and how much expertise they involve. Just as we-Instructional Design Librarians-aren’t trained in learning theory, we are also not technical experts in all things. I think to make such videos great, you’d need to work with a graphic designer and filmaker. Anyway, food for thought and thanks again for a great post!